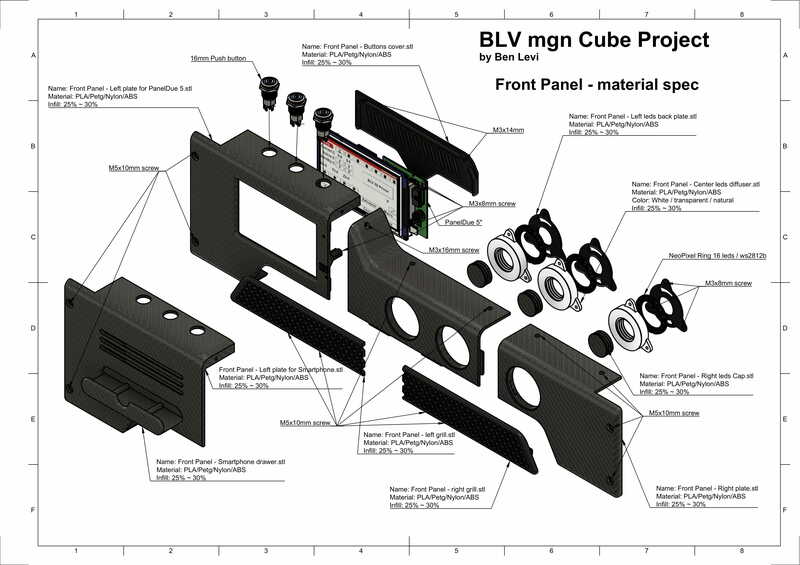 BLV mgn Cube - 3d printer by Blv is licensed under the Creative Commons - Attribution - Non-Commercial - Share Alike license. 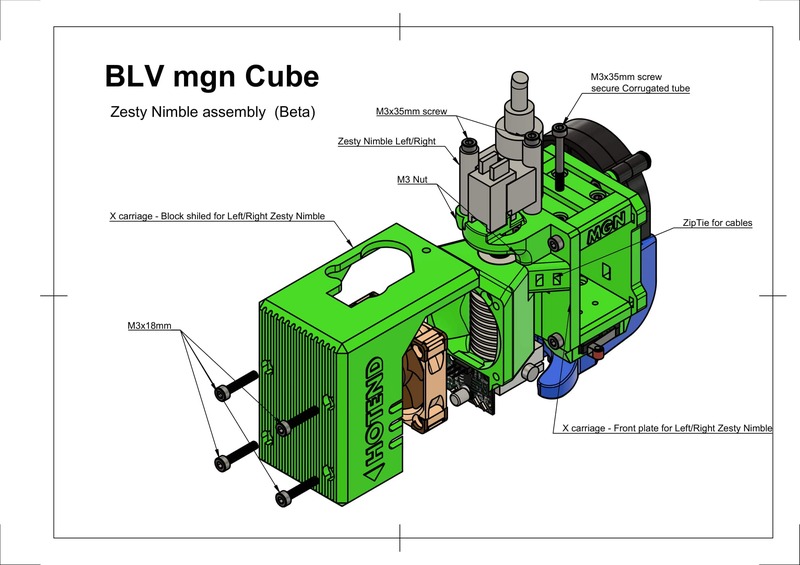 Hi, my name is Ben Levi and This is: "BLV mgn Cube" open source 3D printer project. 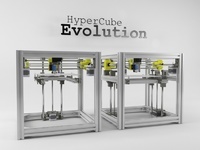 building your own good and a reliable 3D printer, is the main purpose of this project. 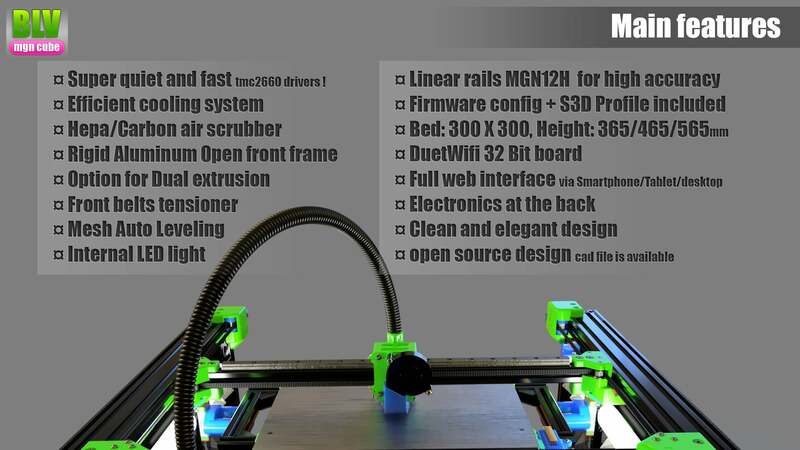 Basically, it's an open front structure CoreXY 3D printer, based on mgn linear rails for maximum accuracy, efficiency and high print quality. Notice: I promise to update this Project page on a weekly basis until it will be completed. The linear bearing and Delrin Wheel Gantry commonly used at most of the low-mid 3d printers as a cheaper solution for linear motion. well, ye.. it's cheaper but at the expense of accuracy and reliability. 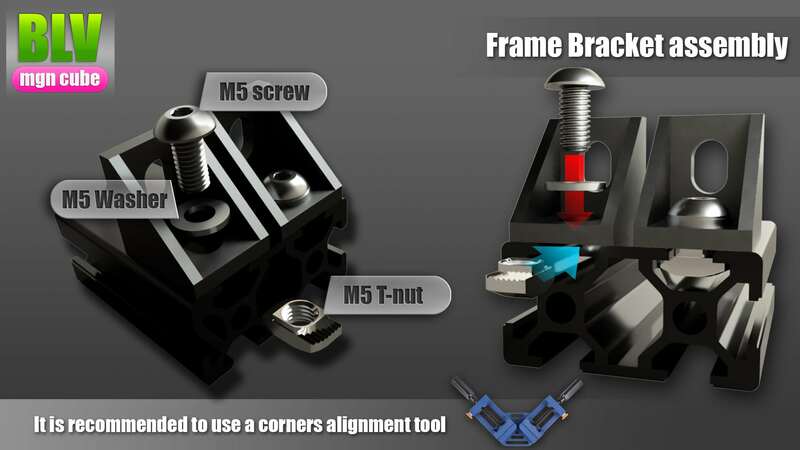 linear guided rails (mgn rails) are a way more rigid, extremely precise and smoother then linear bearing or Delrin. 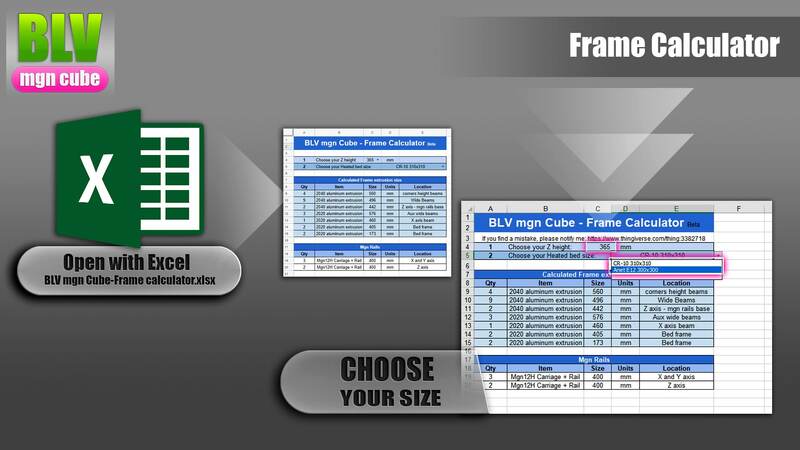 shorting print time without compromising on print quality. There seems to be a good reason why they are mostly used with high-end 3D printers. So, i found cheap Chinese mgn rails at Aliexpress and thought to myself why not? 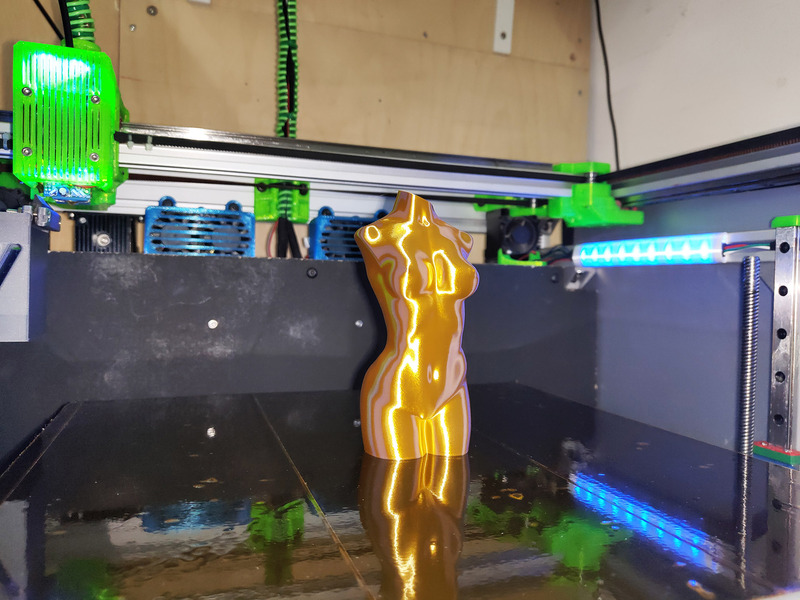 I focused my efforts on designing an open front structure that will be rigid as a cubic structure but yet giving you easy access to your build plate and prints. the design includes a front belt tensioner to make it even more convenient. It came after spending tons of hours software simulating and physical stress test. All the parts are easy to find, print or make. 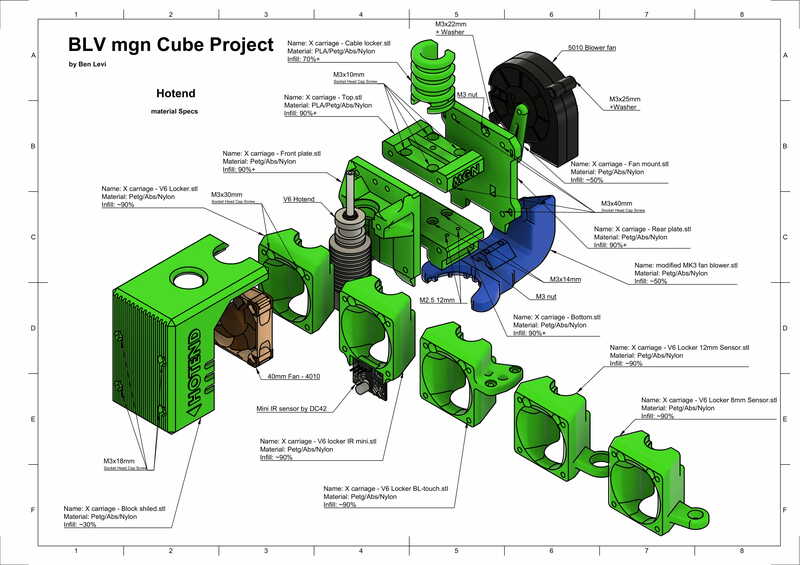 You will not find in the BOM an expensive CNC special machined parts or parts that are hard to get. most of the parts are printed or you can buy them online / locally. Notice that you can use your own electronics - as long as you have the knowledge to make your FW suitable to the build. You don't need to ask for the original CAD files since i already included it inside the project folder. I admire this community and believe that sharing is the main key in order to make this project even more better. 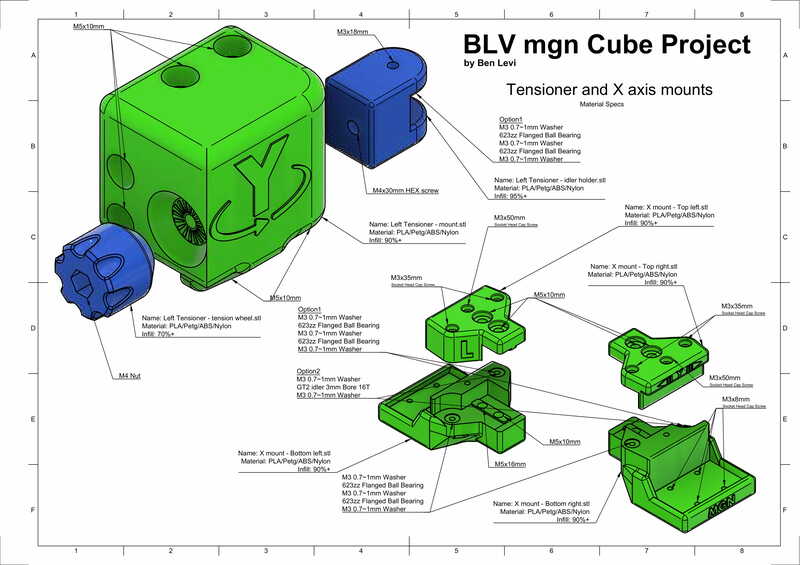 Feel free to download the CAD files (Step file) and modify, add, remix or improve it as you like. I would appreciate if you could please share it with this awesome community and mark the remixed parts as a "remixed" linked to this project page. 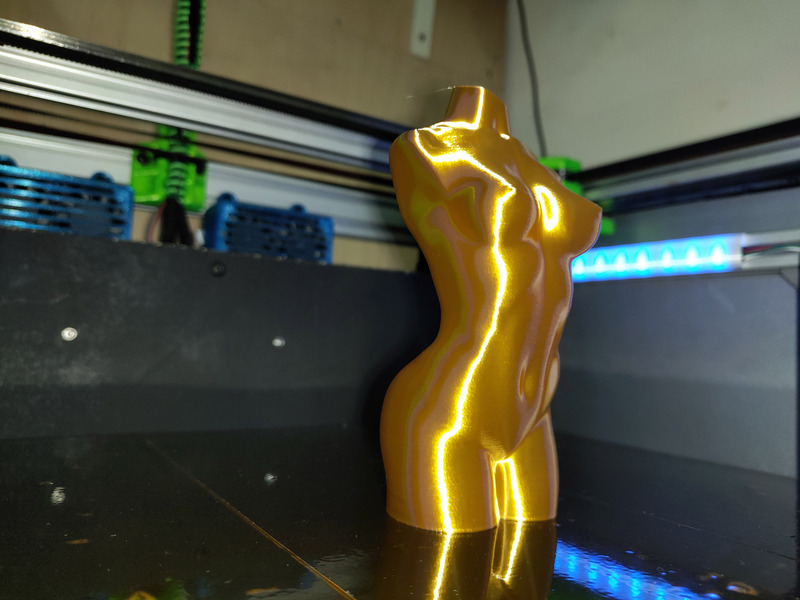 I spent many hours adjusting the Firmware for this 3D printer and fine-tuning the best slicing profile (Simplify3D) for it. 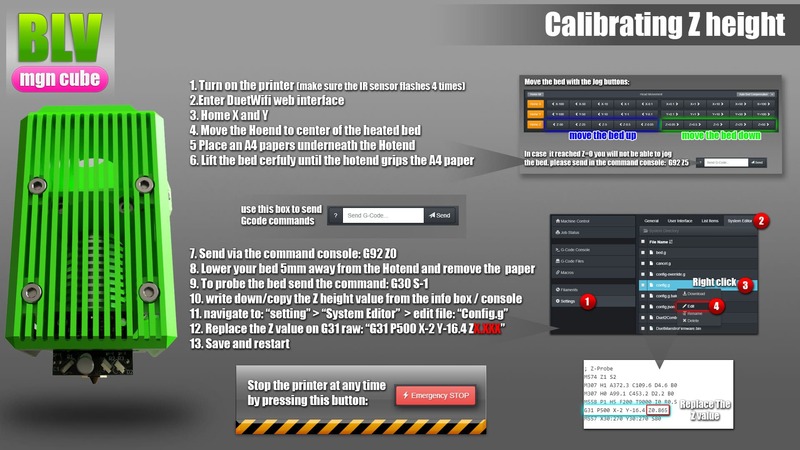 After building this printer you will only need to upload the config files, load your slicing profile and you are good to go. The design is more flexible then you think. 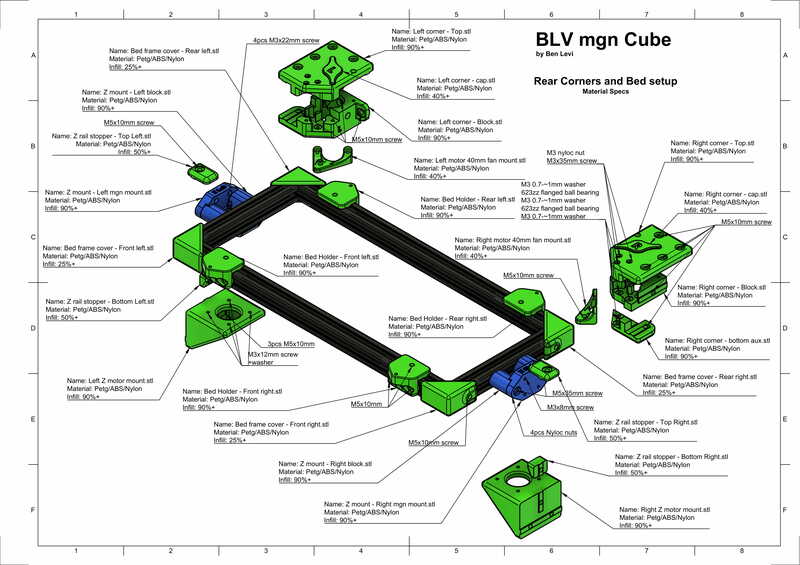 the printed parts and structure designed to be modular. 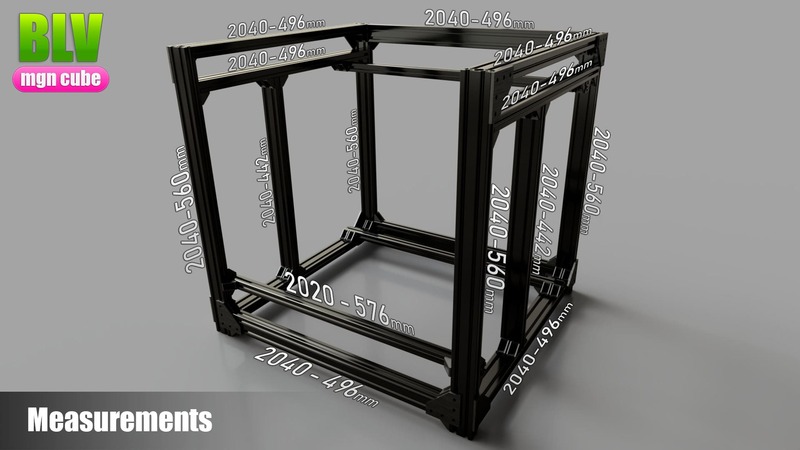 Not only you can choose your Z height - But you can use a much bigger build plate. 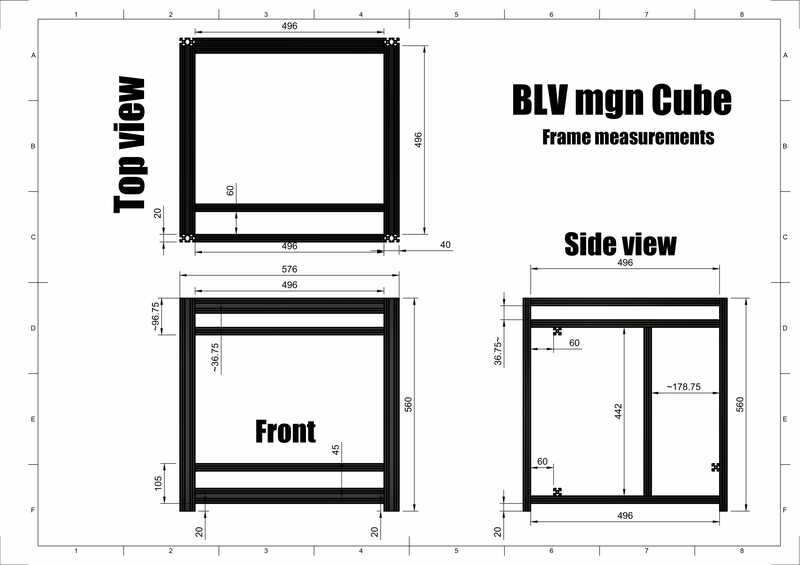 all you need to purchase a bigger aluminum profile and mgn rails. 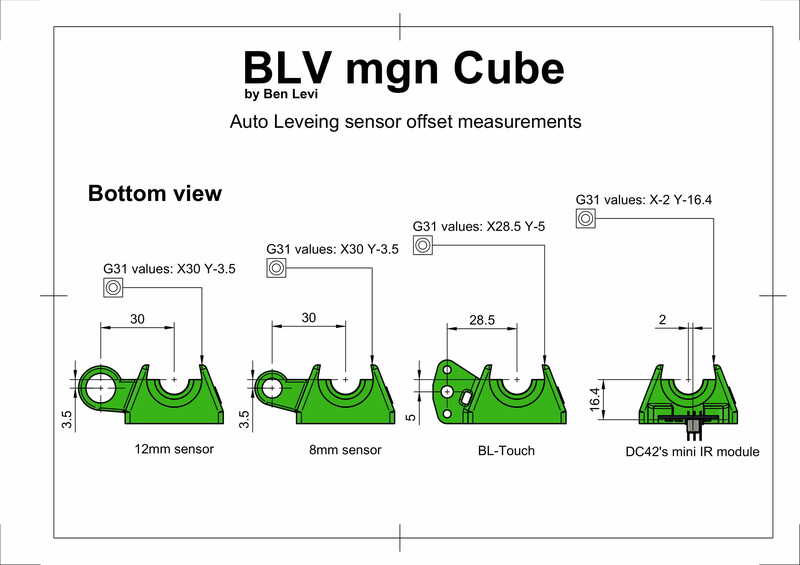 The provided CAD file will assist you calculating the right measurements for your customized "BLV mgn Cube" 3D printer. To be honest, the rails installation will take 70% of the build time. 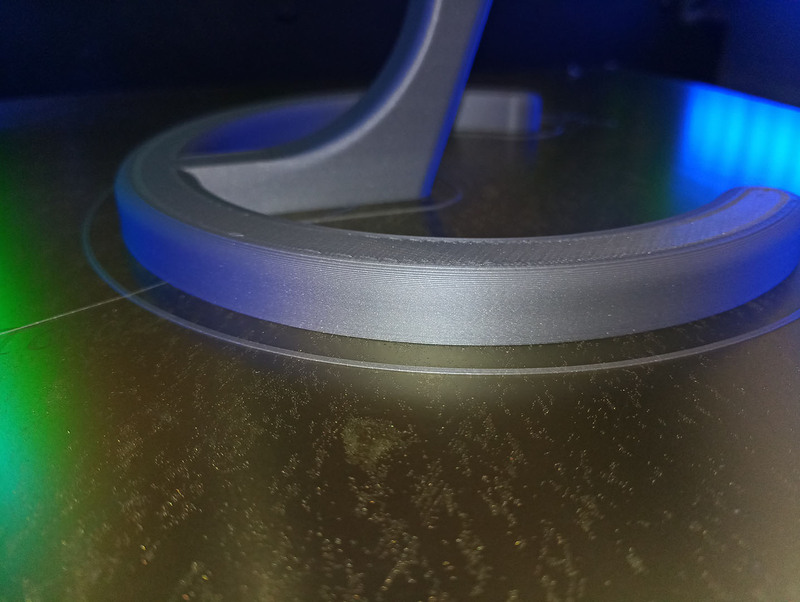 you will have to be accurate and spend a few hours aligning the rails, but boy.. the joy you will feel when it prints will worth every minute you spent installing them. To make it easy on you, I made a 3D animation videos as instructions, Information PDF, sketches and measurements. The cost was important, therefore the BOM is balanced to give you the best money-value ratio, without compromising on quality. 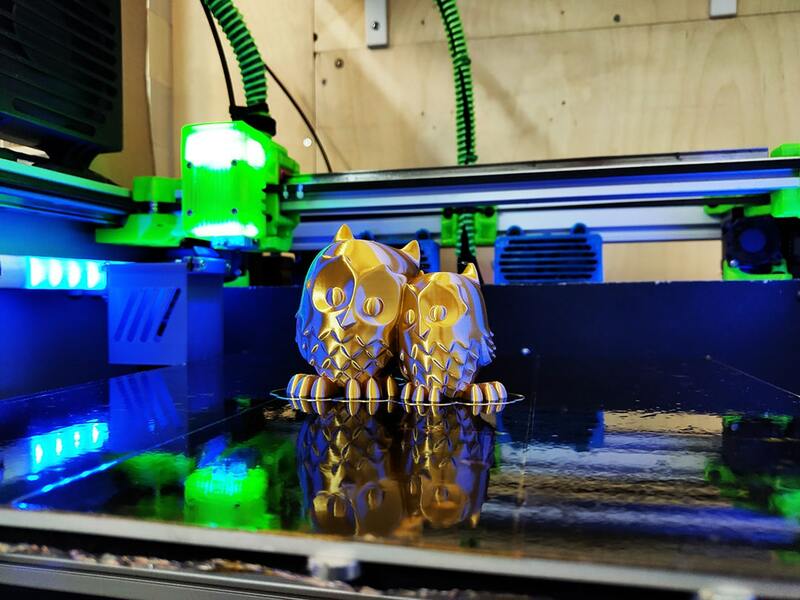 you will find The best 32bit board a 3D printer can have. 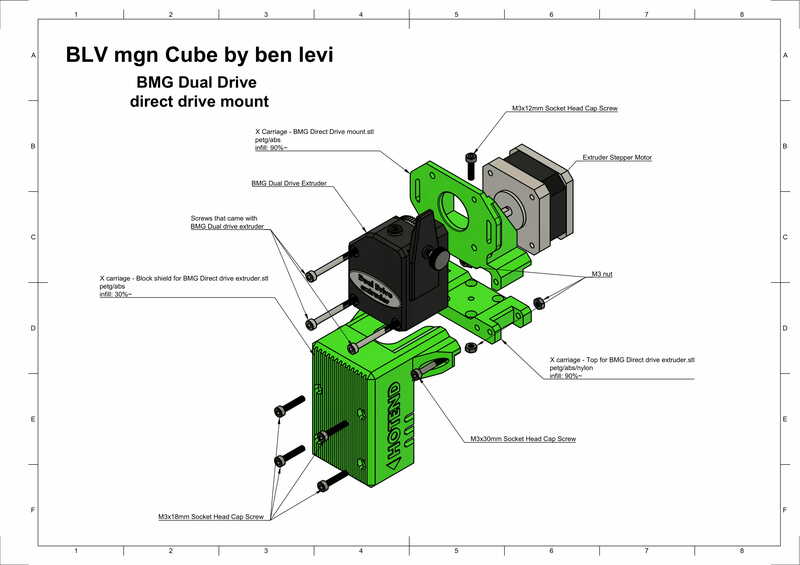 Excellent stepper motors, sensors and so. you get to chosoe if you want to have a 5" paneldue touch screen or save 80$ and use your smatphone/Tablet screen without losing features. To your convenient, i added below an Online 3D viewer links. 9/2/19: added block shield for Bltouch, 8mm,and 12mm sensors. 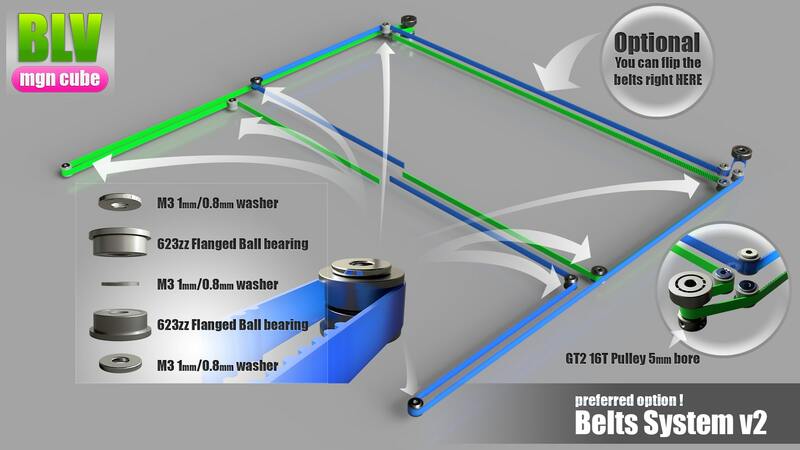 26/2/19: Belt system V2 updated - Please use only flanged 623zz ball bearing+flip belt. 19/3/19: added Step file (CAD) for the DirectDrive setup. 31/3/19: Fw updated - added M80 PS_ON command on startup. 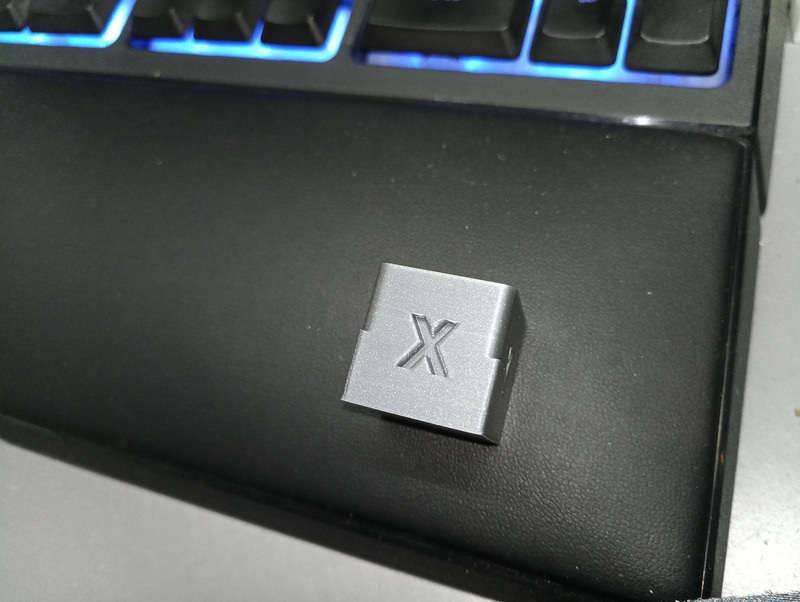 4/4/19: added DXF (vector file) for the enclosure panels. 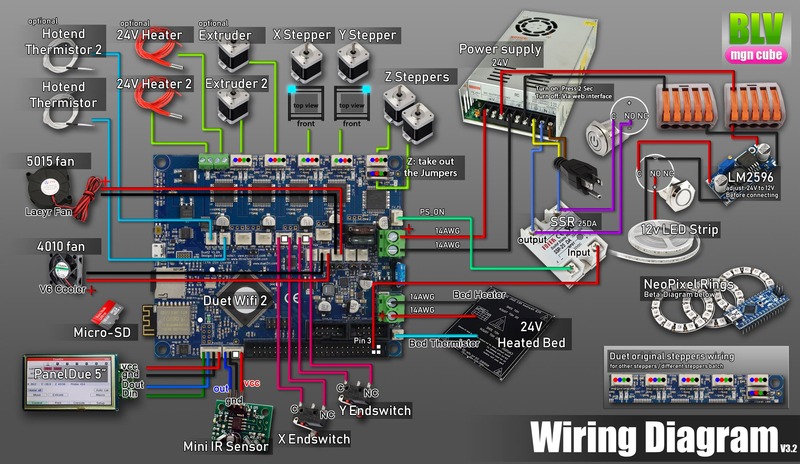 17/4/19: added Neopixel wiring diagram (Beta) and Mimasx Code ! 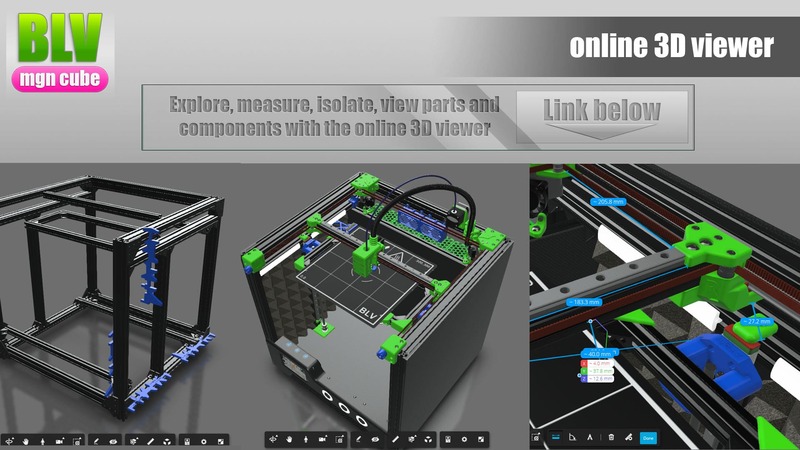 Start with reading the Thing description and "more info links" section, watch the 3d animations, explore the printer 3D model with the 3d viewer, read the pages I linked in the "more info" sections and make sure you understand the printer structure. The waiting - is the most frustrating part. make sure you got all the needed parts. prepare spares of T-nuts, screws and so on. If you have decided to use your own electronics, make sure you know how to correctly configure the firmware of your board. Install your Electronics carefully. Check your connections and wiring diagram closely and make sure everything hooked up correctly. don't make any shortcuts and use the right tools and parts. the Power cable should be the last thing to connect. Update you DuetWifi board to the latest version and upload all the provided config to the sd-micro card, then insert it to your board and power up the system. make sure that the Mini IR sensor blinks 4 times right after powering the printer. please don't move the axis before checking endstop response. Try to home the printer - the printer should move to the left and then to the rear for the printer. if it isn't - check ou motors wiring and config. calibrate your Z height and check your sensors reading (temp). if everything looks good load filament and print a calibration cube and so on. maintain your printer by greasing the rails with a Synthetic grease with PTFE or sewing machine oil. Keep the rails clean and the belts tight. Also, Clean your PEI build plate with alcohol after every print. 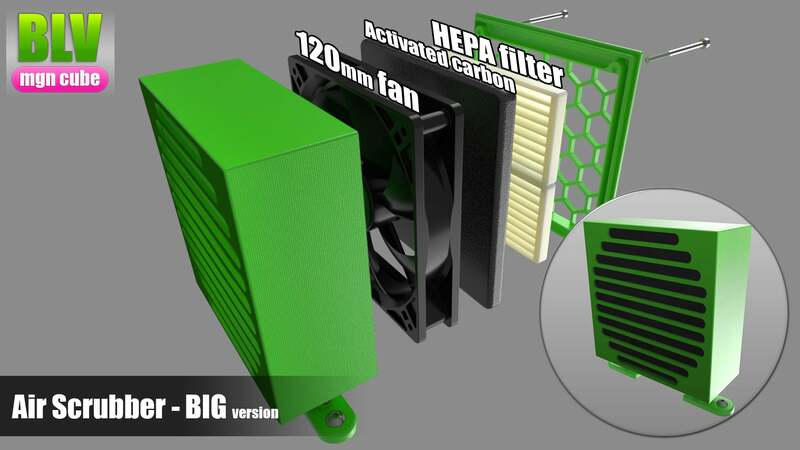 If you are using the Air scrubber - please replace the HEPA filter when needed. 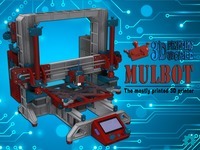 I would appreciate if you could please upload your new built 3D printers pics. Knowing that it helped you create your own 3D printer - for me, it's worth all the hard work and many hours that I spent in this project. Please Be precise and use the correct extrusions without shortcuts. 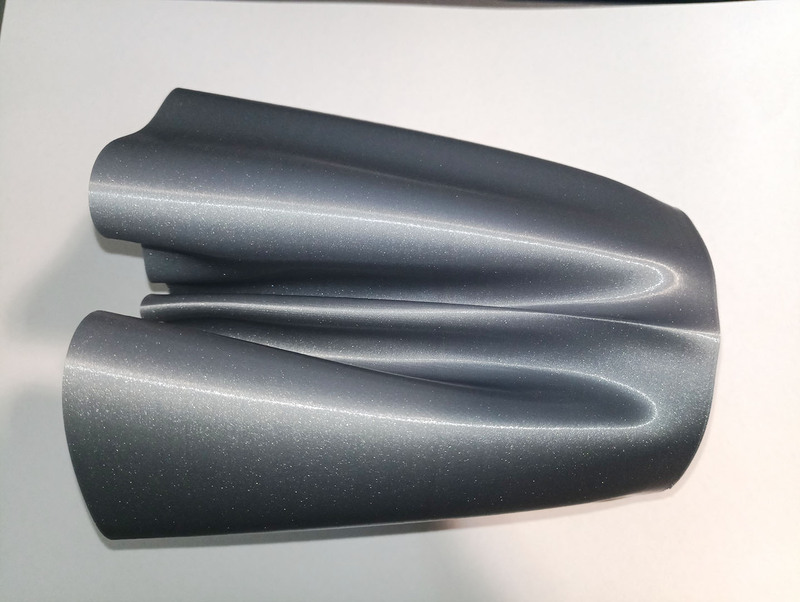 using 2020 profile instead of 2040, may reduce the frame rigidity. 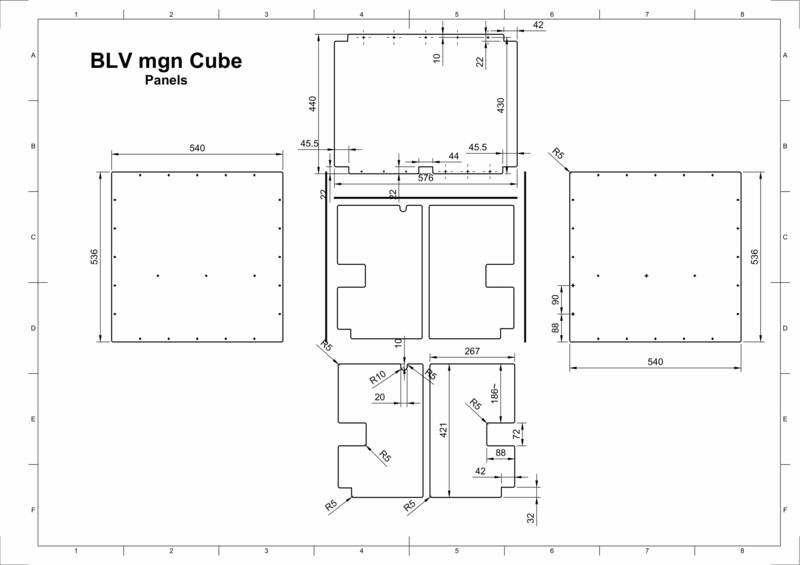 It is recommended to use normal extrusions with mgn rails and NOT V-slot. Please let me know if you found any typo/mistake and I promise to fix it ASAP. 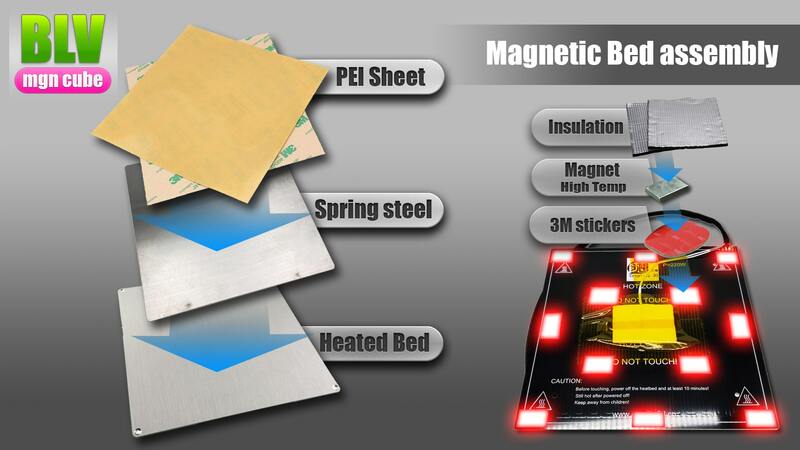 The Blurolls store from Aliexpress has started to offer at a pre-sale Kit for the project. 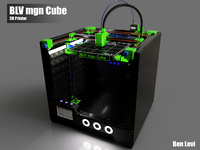 It contains most of the needed electronics, frame, screws, pre-crimped wiring, panels, tube, brackets and more. 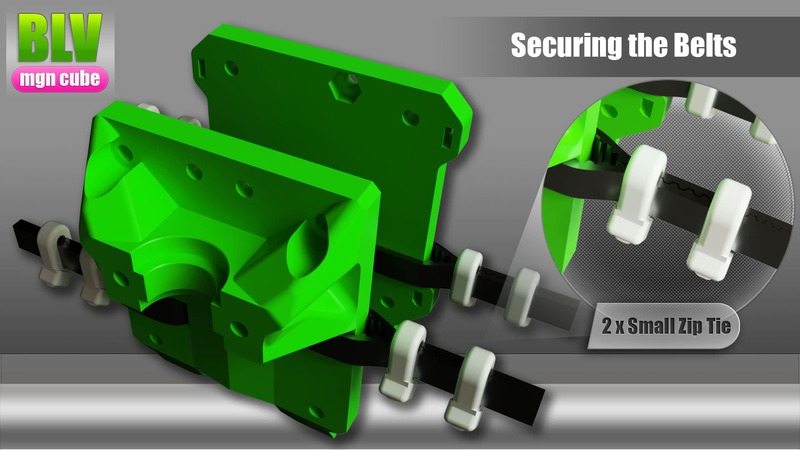 I think its a pretty convenient solution, especially when part of the deal is genuine Hiwin rails! notice that you may be able to get a much cheaper price for the extrusions locally. cheaper rails for 17$ each (i bought it first). Hiwin rails which are the best rails exists on earth. offer a full kit of Hiwin rails for 38$ each rail. in my area ii sold 80$ for one rail. if you can afford it - That's a steal! motion with no play.. smooth as a hot knife on a butter right out of the box. 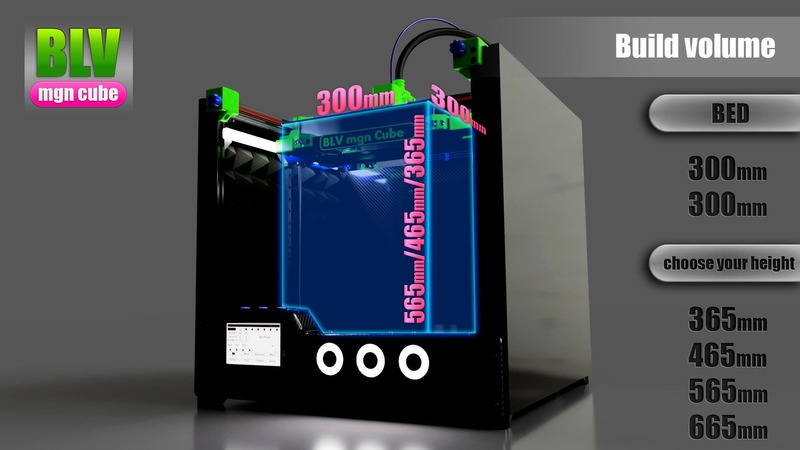 even E3D chose to use Hiwin rails with their builds. Dont forget to ask them to give you a full D-cut shaft! As you can see there is only one option left, please do not use the geard GT2 16T. 1 x DuetWifi 32bit main board from Filastruder.com Not recom' the cheaper Clones. 1 x PanelDue 5" screen (not the "5i") OR save 80$ and use your phone/Tablet ! note: Usually a large quantity of screws is sold in bulk so i rounded the quantities. How i created the walls / semi-enclosure? Well, it's cheap and very easy..
Then apply this adorable Carbon Fiber Vinyl on the board. you can use M3/M5 screws to secure the board to the panels. 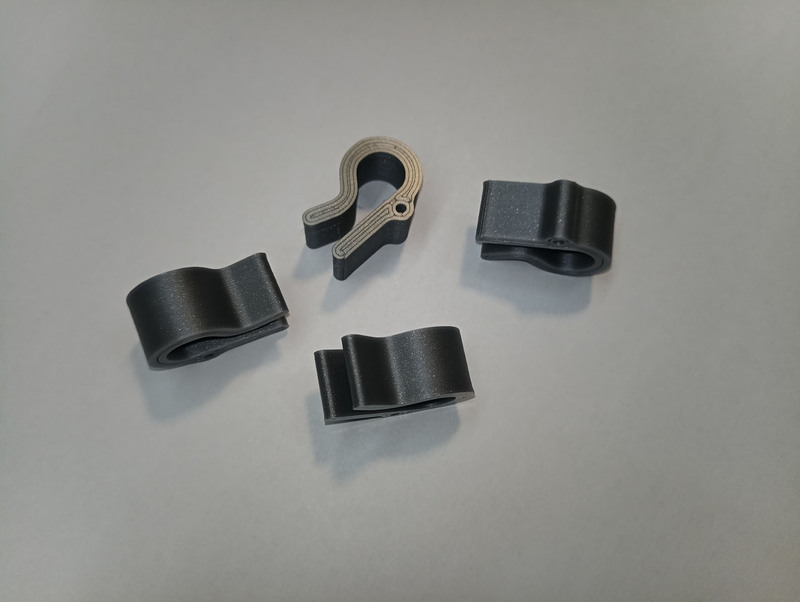 MUST have: 90 Degree Corner Clamps if you want a good printing results. 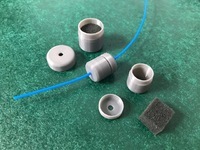 10 pairs JST Plug Male to Female Wire Connector for Dupont wires. 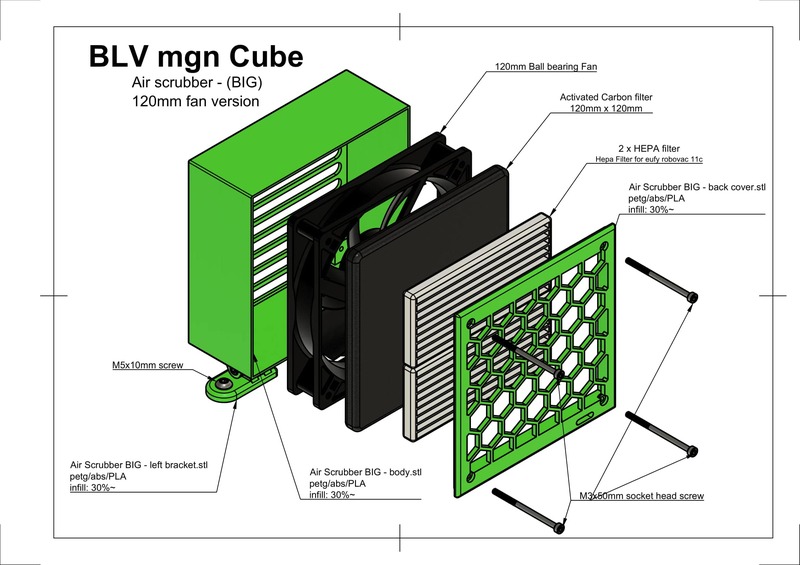 dehumidifier (moisture absorb) for your dry box The best i have tested in my drybox. 1. 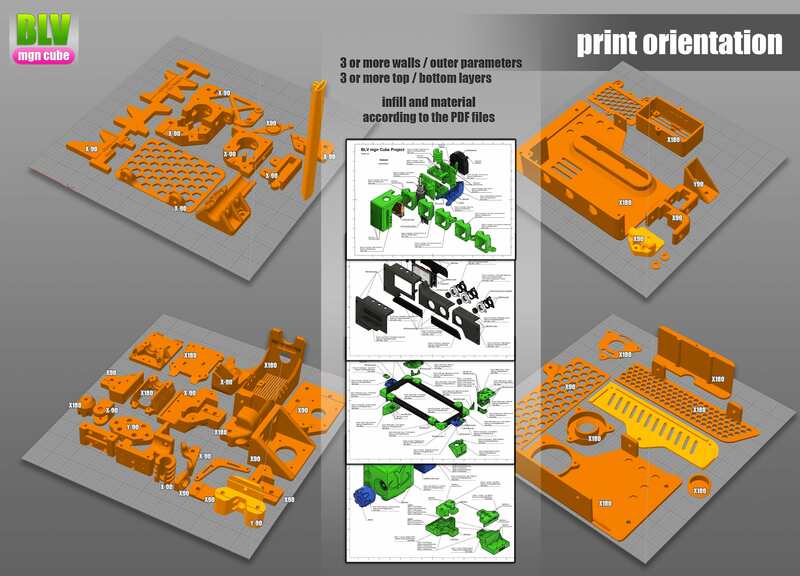 Print Orientation guide - The image below visualize exactly how you should place all the parts on the build plate. 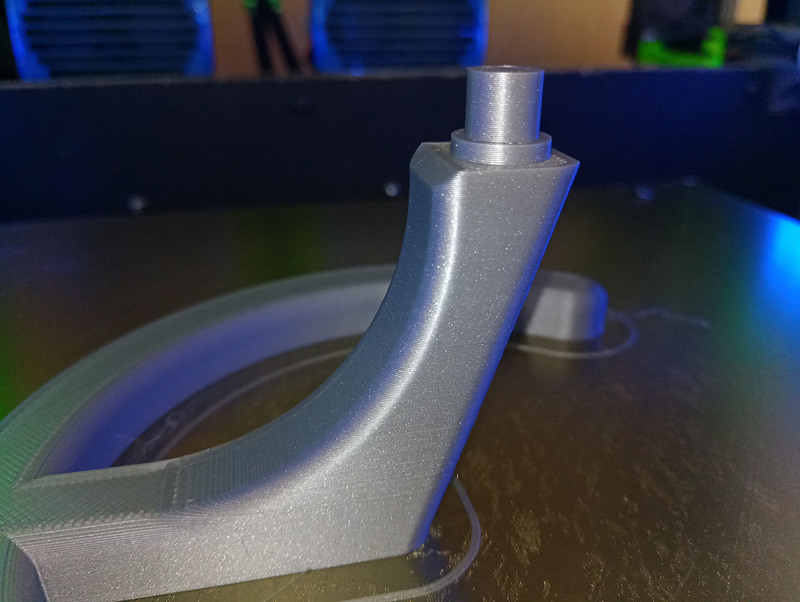 Some of the parts will require support such as the Tensioner idler holder, so pay attention before hitting the start print button. 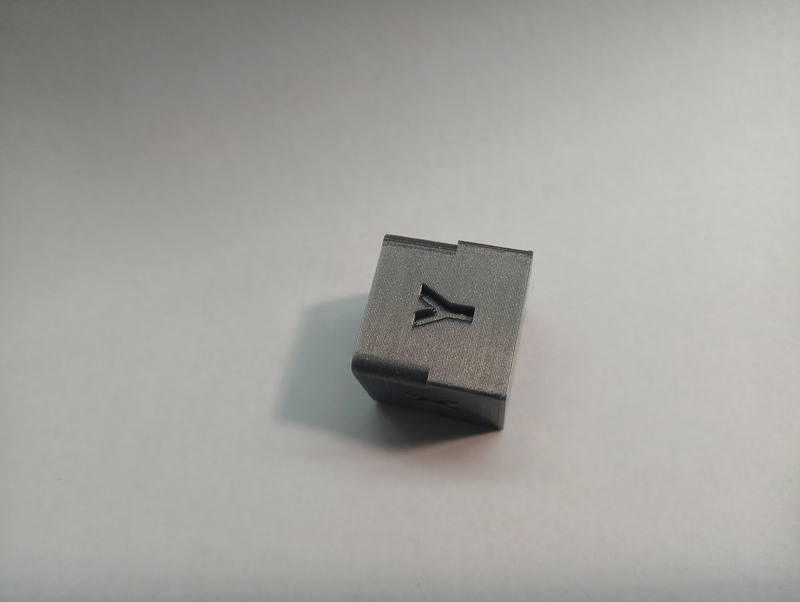 you may notice that on some of the parts has text such as: X90, Y-90.. its the rotation value in order to set the part on the build plate correctly. PDF fils/Images - down below you will find a few sketches of the main components. 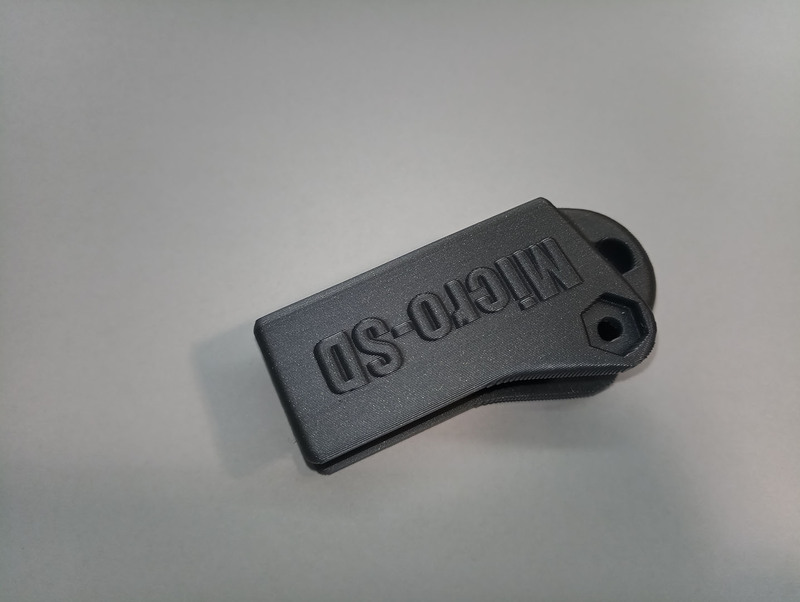 Each part has his name on with the recommended infill percentage and material to print with. Personally, I would recommend printing all the parts with PETG, especially with parts that located in hot areas (heated bed, hotend..). and the recommended infill/material suggested below. fixing the mgn rails can be very frustrating. it need to be perfectly aligned and straight. else, it will give you a headache, so don't start this project without tons of patience. Well, i used a cheap Chinese mgn12H rails from aliexpress cost 18$ each. After buying from 4 different Aliexpress sellers i found the best rails sold here, at "CNA Mechanical Parts Store" store. I even not needed to clean the rails! The block is sliding smoothly without the need to clean it. Wonderful rails, highly recommended! Please be careful and DO NOT buy rails from: "RDC Official Store" nor "linkcnc Store" at Aliexpress. "linkcnc Store" sold me an awful rails which was used, damaged and shorter then what i ordered. 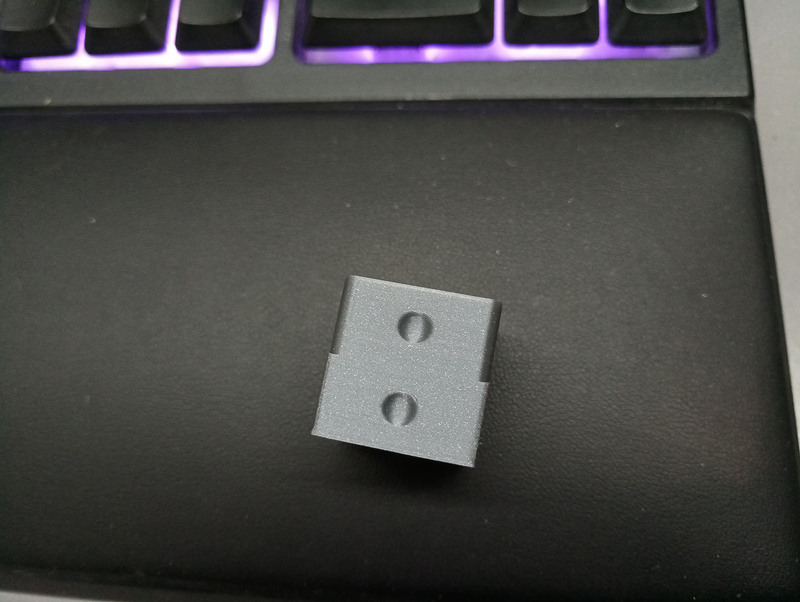 even after cleaning and lubricating it was still stuck and jammed "RDC Official Store" started to ship mgn blocks with non mgn standard size, so i can no longer recommend on him. notice that the mgn rails you'll get will not be smooth as it should be. at the factory, they lubricate it with a protecting oil that needs to be cleaned away. There are some videos on YouTube showing how to clean the carriage with WD-40. Don't forget after cleaning both rails and carriage to lubricate it with sewing machine oil or Teflon silicone grease. As for smoothness: Please ignore the method for testing smoothness by tilting the rail - its wrong! You want it to be smooth but not too much. Also, since its miniature rails, please don't use too thick grease for lubrication. note: after assembling all steel balls, you will be left with empty space of one steel ball. 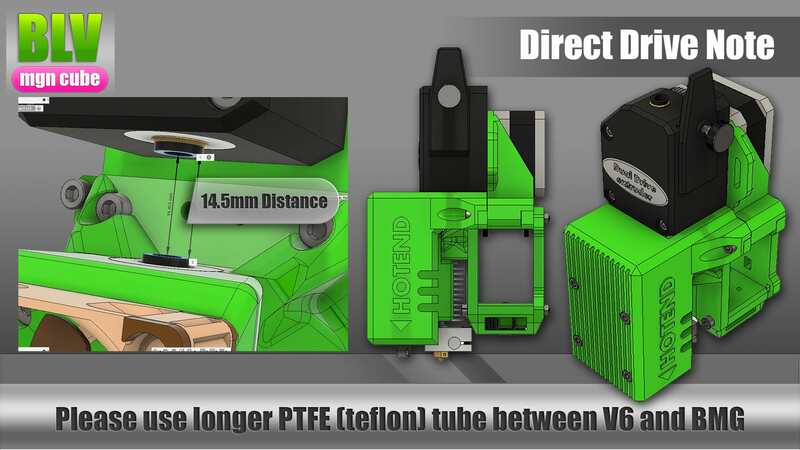 Small request: In order to make all the information concentrated in one place, I would like to ask you to use the Thingiverse forum for this project and comments. unlike facebook - in here you can find answers more easily for common and repeated questions. I want to give heartfelt thanks to my lovely wife for encouraging and supporting me throughout the project. This great community for making this place my second home :) Thank you! There are no conditions other than the license terms. You don't have to, but if you insist a small donation will be greatly appreciated.